Athletic Bilbao came from behind to produce a dominant second-half performance and beat Valencia 3-1 at San Mames. Dani Parejo put the visitors ahead on 19 minutes with a stunning free-kick but his side’s lead lasted little more than 10 minutes, ended by Aymeric Laporte’s close-range header. 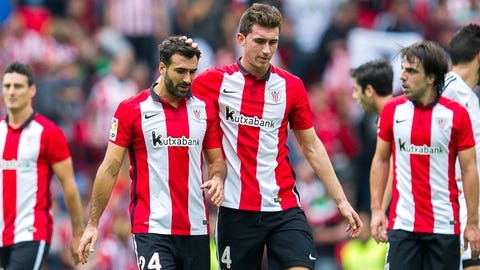 Athletic were galvanized by the equalizer and swept their opponents away after the break, taking the lead for the first time through Markel Susaeta on the hour mark and then former Valencia striker Aritz Aduriz sealed the three points not long after. Neither side had made the start to the season they would have desired, with Valencia taking nine points from their six games and Athletic just four. Nuno Espirito Santo’s side were lifted by a vital win at Lyon in the Champions League in midweek, however, while Athletic lost at AZ Alkmaar in the Europa League. Valencia settled quicker than their nervous hosts, who were struggling to string more than a couple of passes together, and after testing Gorka Iraizoz on a couple of occasions they took the lead. Standing to the left of the penalty area, Parejo curled the ball over the wall and into the top near corner, just beyond the reach of Iraizoz. Athletic’s imprecise passing prevented them from causing any real danger from open play, and their equaliser came from their usual forte, set-pieces. Alvaro Negredo could only head a corner back across his own goal towards the far post, where Laporte was waiting to head home. Athletic then grew in confidence, and ended the half looking the more dangerous side. Bar an early opportunity for Negredo immediately after the restart, Athletic carried their confidence into the second period. Aduriz had a shot destined for goal blocked by Shkodran Mustafi, and then a forward burst by the striker forced Jaume Domenech to come racing out of his area to clear the danger. But a minute later Athletic completed their turnaround. Aduriz raced towards the area and when pursued by Ruben Vezo slipped the ball into the path of Susaeta, who swiftly knocked it beyond the reach of Domenech. The goalkeeper had to be alert again just moments later to repel a shot from Inaki Williams as Athletic exerted their grip on the game. They then tightened it. Benat Etxeberria recovered possession in the centre circle and then gave it to Raul Garcia, who marauded forward with power, playing in Aduriz in the area. Athletic’s talisman did the rest, controlling with one touch before arrowing into the bottom corner.